Most people who know me know that I hate Facebook. I almost never update my status or add pictures. I only do it when I’m going on holiday or to a concert (bragging rights, if you will). In fact, there is an interesting video here on why you shouldn’t take people’s Facebook lives seriously. Remember, people are more likely to brag on Facebook than to write a status that says “My life is poo.”. Take everything with a pinch of salt, and remember that nobody has a completely perfect life. Anyway, that’s not what I’m discussing today. What I am going to be talking about is my Facebook pet peeves. I.e. what people do on Facebook that really annoy me. Normally, if I see people doing any of the following activities I will remove them as a friend. I’m sorry but I can’t even cope! Unless some of your friends are trained medical professionals, why would you go to Facebook for medical advice? I’ve seen people posting pictures of rashes, bruises and cuts, asking their friends “What do you think this is?”. My top tip for these people is to go and see their GP, or make a trip to A&E if it’s really that bad. And please, spare me from the revolting pictures of your infected cut. I don’t need to see that when I’m scrolling Facebook, eating my breakfast. Nothing says “I’m desperate for attention and likes” quite like changing your profile picture several times a day. I’m talking about those people that have just two pictures and switch between every hour or so. I will get pretty annoyed of seeing the same picture all day every day in my timeline. People are going to be less inclined to like it the more you repost it. You see, I’ve copied and pasted half the song here. I’m not on Facebook for a sing-a-long. This just isn’t necessary. Text talk annoys me in general. I don’t even use it when I’m texting. I’m at a stage where most of my friends on Facebook are aged 18 or older. At that age there is no need for sloppy, childish writing. If it gets to the point where “See translation” pops up under your status then you are doing it wrong! I can’t be the only one who hates these posts. There is usually a picture someone in hospital suggesting that if you hit “like” they will live, but if you ignore it they will die. It’s like the old fashioned chain mail, where if you didn’t pass on the message to 20 people before midnight you’d evaporate, or some rubbish like that. Some people are so gullible. Similarly, I hate posts that say “First 5,000 to like will get a free XBOX”, because we all know that this person/company/whatever hasn’t got 5,000 XBOXs (is that even the plural?!) to give away. 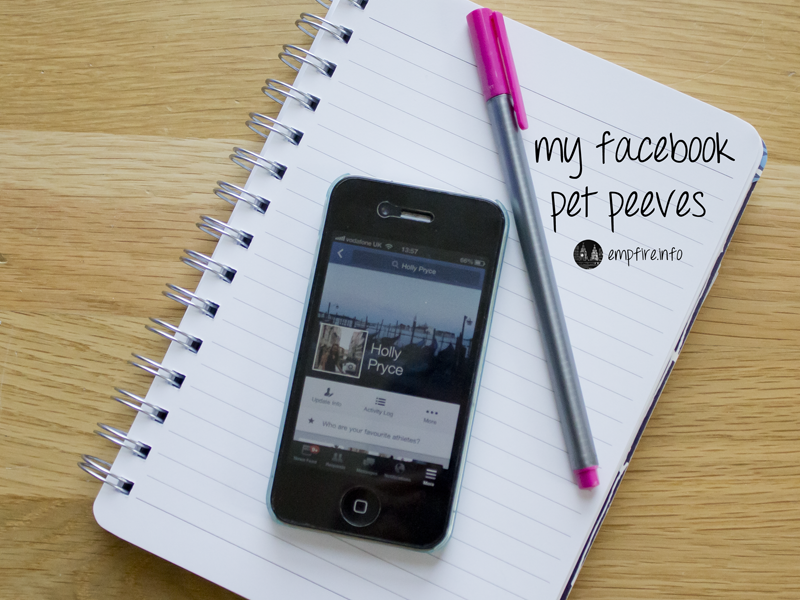 What is your biggest Facebook/social media pet peeve? I’ve found the courage to comment. Ah right. My links page is a collection of blogs that I regularly read. I totally agree with everything you said… what I hate is people posting all the selfies they have posted on Instagram on Facebook… I mean I don’t want to keep scrolling through me news feed just to keep looking at the same person’s face clicked in different angles! I have the same issue with instagram selfies on Facebook! So annoying! I registered my Facebook account years ago and I don’t really use it now. Mainly because people keep sending me game invitations. I totally agree with most of the things you stated, though I’m not sure about #1. I’ve never seen pictures of bruises and cuts on my news feed, that sounds nasty. I must just have weird friends, haha! I have the same issue with game invitations. I’m constantly getting notifications for those. I hate Facebook too. I’m rarely on it now and mainly keep it as a way for people, who don’t know my email, to contact me if needed. There’s just way too much going on in it. Fortunately, I haven’t seen #1 or #2, though I don’t like it in general when people try to self diagnose with info they find online. The other 3 bother me though, especially the last one. I mean, liking a Facebook status doesn’t make a difference. If they truly wanted to help, then they should find other means and then advertise those, like a fundraiser or something. I actually get bothered by people who post about their pets or kids way too much. I don’t mind if it’s sometimes, but not when it’s all the time and really frequently. I also don’t like the super vague rants or statuses, where you really can’t tell what’s going on. I mainly use Facebook for messaging too. That is one of the main reasons why I haven’t deleted my account. People who post too many pictures of their children annoy me too. I have removed people as friends before because they are constantly posting pictures that I don’t care about. THIS. Most of my younger sister’s friends added me on Facebook because I’m such a cool older sister (I think they’re realising that I’m really not) and I used to get there profile picture changes ALL the time. I don’t /hate/ Facebook, but I just don’t see why people must brag to people. I say leave that for Twitter. Obviously, I put my holiday pictures up for my family overseas, but other than that I usually keep an eye on the pages I’ve like for all my television shows. And now that most of my friend’s are working, they keep inviting me to like the page of the company, etc. Which I did do in the beginning when I first started, but then you realise that Facebook is still quite personal and it’s not cool to be mixing up everything. I think the only reason why I hate Facebook is because of the people on there. Overall, it’s not a bad site at all. Ugh, people. Haha! Facebook (sadly) has been my longest relationship– ongoing 9 years. Sad, isn’t it? I don’t hate FB, but I definitely don’t use it as often. Mainly, I share relevant articles, posts and music videos that I find poignant. I only utilise facebook chat and I will occasionally facebook stalk. The only reason I change my profile picture so often is because I’m fickle 😛 But other than that, the majority of your list annoys me as well! I only really use Facebook chat too. It’s one of its better features. I have actually removed someone as a friend on Facebook because of #1. It’s just so wrong and irritating. I hate Facebook as much as… well, I don’t have Facebook and never have, but your pet peeves – and hearing from a lot of other people about their own pet peeves – are the main reasons I just simply don’t use Facebook. People can be ridiculous on it, and use it to get attention. I might just comment on each of your peeves! Let’s start with number one. It’s bad enough that the internet has become a place for people to seek medical advice by Googling, and land on websites that warn you a dozen times to “please see your GP or doctor for professional advice, this is only a guide”. Now people are asking for advice on social media? It is indeed a bit wrong. There are people who even ask about really private things… which is inappropriate and really, really weird. Admittedly I change my photo on Whatsapp a lot of times, but that’s just because I’m bored, and Whatsapp is just a chatting platform, and it’s mostly all private chats. I don’t change my profile picture on Twitter that often. Every week is probably understandable, but a few times a day is unnecessary. Text talk is amusing, and I only use it if I’m being sarcastic, ie. “lel u r the worst at making jokes man”. That is all. Please don’t get me started on #5. Not only do things like that annoy me, they can be very ignorant, and the people who believe them are more annoying than the people who create them. It’s borderline chain mail – you remember that 1999 to early 2000s stuff, right? Send this to 15 people or you’re dead? Hahaha. One thing that annoys me on social media and completely trumps everything is teen quote Twitter accounts or Tumblr accounts. Stuff that posts things like “hugs are so great”, “There is nothing worse than homework”, “Teacher walks in when you’re passing a note and you’re just like [insert photo here]”, “Love is ______”… just, anything along those lines that is a combination of cheesy + messed up + so immature + naive + annoying as hell. Also since most of them mope about how you can’t get a boyfriend if blah blah blah. Haha, I love how this post has triggered others to rant about that Facebook/social media pet peeves! I also hate those teen quote accounts! Especially the comments regarding boyfriends. It makes people come across as so desperate. I feel you about Facebook; the last time I updated my status was around 2 years ago. It’s fine when people ‘brag’ about their lives but it crosses the line when they say their lives are ‘better’ than someone else’s with intention; to me at least. People should really call a doctor or an actual licensed medical/health person instead of people on Facebook (unless they are a doctor/nurse). I would say Google things first because chances are, other people probably google’d the person’s problems. Thankfully, I don’t encounter too many of these kinds of people on Facebook. The ones that really annoys me are the “hit like if you care, ignore if you’re _______”. That stirs up too much unnecessary attention. If we do care and want to do something about it, we will besides hitting “like”. I hate it when people brag about their lives on Facebook, but in real life you know they are having a rubbish time. It’s all so false. I also get annoyed by the game requests. I feel you about Facebook in general. People do have ‘bragging rights’ about whatever. But when you say that your life is better than others — that’s when I draw the line. My pet peeves goes as follows: 1. I can’t stand when people misuse the words There, Their, and They’re and just use THEIR. 2. Chain letter’s/posts “Scroll if you’re heartless, write amen if you care.” or The ever so famous “Like to save this child.” 3. People using Facebook as a Drama site. 4. People posting pictures of babies that are misfigured and asking to pray for them. I really don’t watch the news because of it, and Facebook has become nothing BUT news now! I’m so irritated by people that they feel the need to mess up my day with their posts on this stuff. I try to stay away from that, and try to post positive messages. Update my statuses with useful information. Try to thank those that have supported me etc. etc. I’m not a bragger, and I can’t stand those that do! I also get annoyed by people who use the wrong their/there/they’re. And those that constantly spell ‘definitely’ wrong. Ugh!! These are all from the same day.. Why can’t she just use twitter in stead of spamming facebook. It is so annoying, but I feel like I can’t remove her because she lives with my friends so that would be awkward. Also I just generally hate the whole, sharing videos, 9gag posts, like this to show you care. It is so unnecessary and it takes up so much space on my wall! So I feel the same way as you. I use it very little, and if I do it is usually to stalk people (see how old they are, if I know them, etc.. lol) or just occasionally (once a year) upload some photos and maybe a status! I prefer Instagram and Twitter to facebook, and mainly use facebook for it’s free chat function. I couldn’t agree more with you about these pet peeves. I may not unfriend. Unfriending takes some serious damage before it happens, but I can unfollow people. I get more annoyed when people spam their accounts and everyone with pictures or always constantly tagging someone. It gets annoying. Argh! I usually ask permission before I tag someone or know off hand if they don’t care. I hate being tagged in every single photo that has nothing to do with me…I try to keep everything on my profile at a minimal. Still, good post!